Today, Let’s Talk About Your Cat features a 3 year old Bengal Cat formerly named Milow that had been surrendered by his owners to a veterinary clinic after being found injured. After receiving lots of love and care from the clinic he got a new name and found his forever home with my friend Angela. Jenko (fka Milow), is one photogenic cat! Q How did Jenko come into your life? A Jenko came into the clinic where I work as an emergency case when he had been shot with an air rifle. The owners surrendered him to our clinic when they were unable to raise the necessary funds to pay for his care. While he was in the clinic, I would visit with him daily and give him hugs and scratches under his chin. Once he was fully recovered, I was fortunate enough to adopt him. His story was one of the inspirations of our Vets Animal Charity which was set up to assist owners with financial constraints in an emergency situation. A Jenko was named after Channing Tatums character, who also got shot, from the movie 21 Jump street. A Jenko is a very sweet boy, and is usually found right next to me. He follows me into the kitchen where I think he would eat all day if I let him, and he loves water! He jumps up on the counter when I turn the tap on in the kitchen or when I am brushing my teeth in the bathroom. Sometimes I will fill the kitchen sink up a bit and put something in the water and he’ll play for ages, even standing with one foot in the water. He is very interested in the shower as well, and I think he may eventually go right in it. He also loves heat and sits directly on or in front of the heating vents in the house. A When I was in high school we moved and I was very sad to leave my friends and the school that I attended. My parents bought me a cat to keep me company and to help with the loneliness. She was a long-haired tabby and absolutely adorable. That was the first cat that owned me and I have had cats in my life ever since. Q Anything else people should know? A We also have a dog named Gertie that came to us from a rescue in California. We originally took Jenko home on a trial basis only to see if they would get along, and he never left. 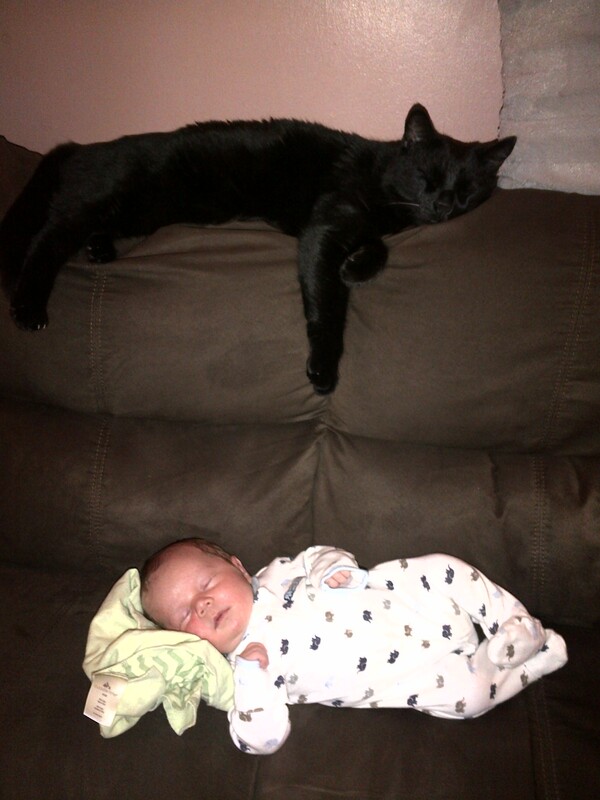 Within the first 24 hours, they were lying next to each other on the couch and Jenko was licking Gertie’s head. Now it’s almost like having two dogs, they run around the house like maniacs and greet us together when we come home. I can’t imagine life without them now! It was the 911 call heard around the world. By now everyone is familiar with Lux the cat. The baby pulls cats tail gets scratched, father kicks cat making things worse and the cat traps family in the bedroom. Next Jackson Galaxy, star of Animal Planet’s “My Cat from Hell” gets called in. Reads like a really bad soap opera. There are so many things wrong with this situation including the kicking of the cat… and then there is all those interviews. In this case I really think they should allow Lux to go to a new home where he won’t have a such a hard time. 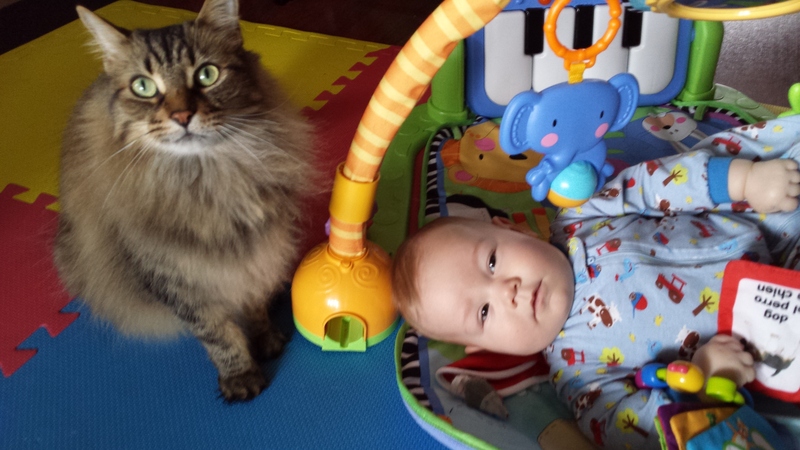 So can cats and babies work? I have friends and cat clients who do and yes it works, they have the best of both worlds. It’s education and preparedness that will help kitty and your little human have a safe and happy bond. Lots of resources exist on this topic and you can always talk to your vet or friends who have cats and kids. “I’ve never had a problem with any of our cats and Brady. 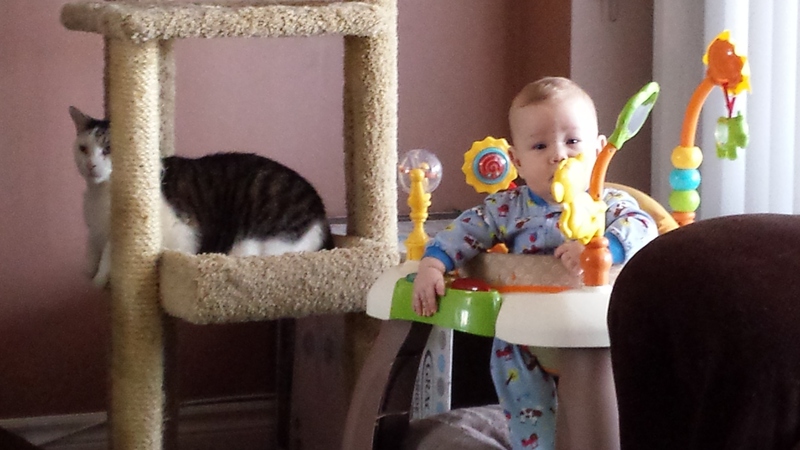 The day we brought him home from the hospital each cat took their turn smelling and checking him out, as soon as they heard the loud cry he could produce, they made sure to keep a safe distance. 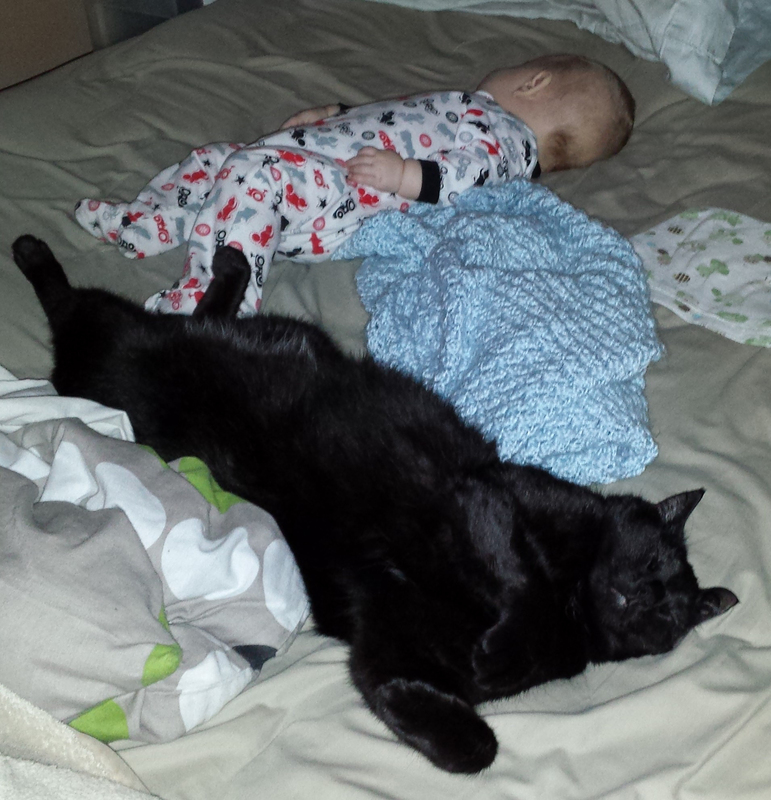 I’ve heard people say it is a bad idea to own cats with a newborn but that is not true. My sisters and I grew up with cats from the time we were born, as well as all my cousins and their families. Brady sleeping with Shy Milo standing by his new brother Brady Beans and Brady London watches over Brady from the Cat Tower Do you have cats and kids? How do you make it work?